After a week off due to a 'brush' with a nasty virus, I was ready to kill something! Lawrence provided the means, by bringing down his Renaissance galleys again. Randomly, Phil got Ian to play alongside, and commanded a fleet of Berber pirates. I got command of a Byzantine fleet with Lawrence as my second. I deployed with 2 large galleys on the left of my line, with 3 small galleys on my right. Lawrence deployed to my right, using his large ship alongside 4 smaller ones. The Corsairs were attacking us to prevent us capturing a port. Ian deployed 3 squadrons of 3 light galleys. Phil deployed to his right with 6 small galleys. He was first to move and managed to get 4 ships of his force advancing. I manoeuvred my large galleys to outflank Phil's squadrons, but only one of my light ships activated. It would have to do! Lawrence managed to advance in 2 squadrons and like me moved to outflank Ian's ships. Ian had advanced a squadron keeping 2 in reserve. The reserves began to move in the forward squadron's support soon after. I finally got my last 2 ships moving, and detached them to demonstrate against Phil's 6. Ian had got his squadrons in fair order to engage Lawrence. Lawrence wisely kept his fleet together, hoping to beat the front Corsair squadron before the following squadrons could support them. The squadrons approached quickly, the Corsairs already suffering from the artillery shooting from the large galley. Ian was starting to worry me as he detached a squadron to attack my ships. ..However, this left Lawrence free to swing after Ian's front squadron unhindered. The large Byzantine galley easily outshot the first Corsair galley. He then tried to ram the second Corsair, but failed. My 2 light ships closed and shot at Phil's advancing squadrons, but with the numbers so much in favour of the Corsairs, we barely held our own in the fight! My 2 ships then turned sharply, to follow my other ships attacking Ian's fleet. Poor Phil was left floundering in my wake! Ian, meanwhile, had recalled the squadron that had been worrying me, and tried to surround Lawrence's powerful squadron. Unfortunately, my main squadron had a disaster, as the light ship attempted to ram (I lost!) and then tried to board, only to be swamped by the Corsair's crew and forced to strike my colours! My large ships now arrived, and shot at any Corsairs in range. Ian, faced by my large ships and the imminent return of Lawrence's squadron, broke off and retired. Phil, being so far back was unable to help. The end positions, with Ian retiring on the left, followed by my squadron. It was an interesting game.I was pleased my squadron managed to split the Corsairs allowing the 2 Byzantine squadrons to co-operate. Truthfully though, the light Corsairs were not really a match for our bigger and better ships, and we never gave them an opportunity to use their greater numbers effectively. I think also that Ian and Phil were probably not fully conversant with the fine points of the rules, and this didn't help them! Next time, it may not be so easy for us! 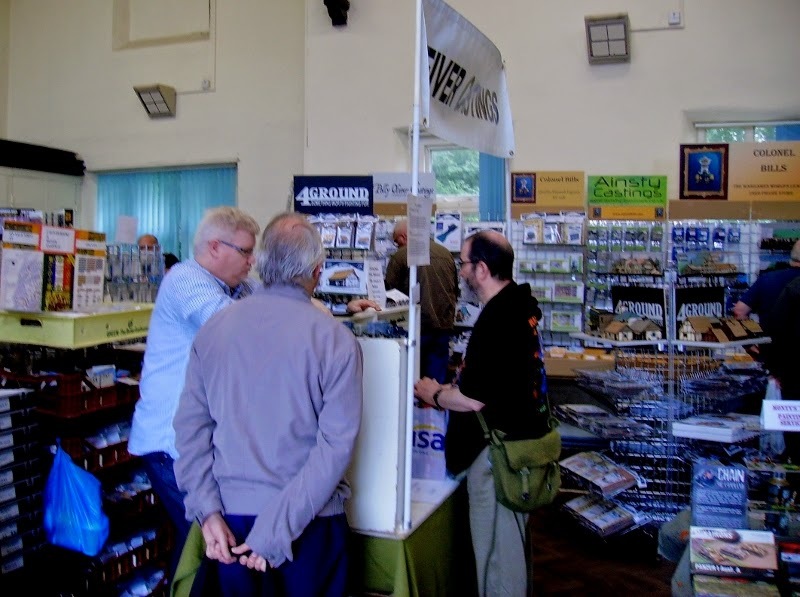 Today, the club was off as usual for the Durham Wargames open day show, an annual event I never miss! Its a good little show in beautiful Durham, which is only a 15 minute train journey from Newcastle, so quite local to us. Ah, here they are! Ian and Lawrence chatting at the Reiver Games stand. As usual, the trade stands surrounded some nice Demo / Participation games. Dave Thomas's is always a must for me! - more WSS cavalry and Perry Afrika Korps were on my shopping list! They also had a lot of the lovely Perry metal figures. Midlam Miniatures stall was seeing brisk business! Colonel Bill's is also a must, if nothing else they have the lovely 4Ground buildings that feature in so many of our club games. The Viking buildings especially caught my eye. The home team, Durham Wargames group, had one of the most impressive games. Lots of lovely models on a splendid gaming terrain. In one of the side rooms. another of my 'must visit' stalls, Northumbria games. I added to my collection of little planes! Still not tempted with the 'Sails of Glory' game, though these models looked nice. Loka Hay's stand. Some nice terrain here. Scheltrum miniatures also had some lovely things on display, and very friendly staff! More very friendly traders... cannot for the life of me remember who these are though! In the centre of this hall, an impressive looking 17th century game. In one corner, some nice buildings. The nice Games of War chaps! - got some lovely asteroids for X-Wing from them! So off to the Bring and Buy, on the way we met Dave (left) and Andy McMaster, making one of his (sadly!) few annual appearances at a show! In the last hall, a nice colonial game by the Grimsby wargamers. Roll on next years show!